Jipp, Joshua W. Christ is King: Paul’s Royal Ideology. Minneapolis, MN: Fortress Press, 2015, pp. viii + 380, $44, paperback. Joshua W. Jipp received his PhD in New Testament from Emory University in 2012. He is currently an associate professor of New Testament at Trinity Evangelical Divinity School. Early in Jipp’s post-graduate studies he became intrigued by “the incredible amount of attention devoted to reflections upon the good king in Greek and Roman writings” (p. vii). In 2013, Jipp began to formally explore the relevance of this ancient kingship discourse (hereafter “AKD”) to NT interpretation. Jipp’s paper (a pre-publication of Chapter 2) won him the SBL Paul J. Achtemeier Award for New Testament Scholarship (p. viii). Jipp’s thesis is that Paul’s teachings about Christ are best understood within the framework of AKD (p. 42). Jipp relies upon abductive reasoning (finding the simplest and most likely explanation), evaluating his claims on the basis of their historical plausibility (pp. 135–137). With his focus squarely on the historical Paul, Jipp is not interested in drawing distinctions between the “Messiah” and the “king” in the LXX (pp. 29–30), or between “biblical” and “extra-biblical” language (p. 79n11), or between “Jewish” and “Greco-Roman” concepts (p. 17); all of these can be considered collectively as Paul’s conceptual resources. Paul reworked these resources in light of the Christ event (particularly the resurrection), creating a new and innovative Christ-discourse (pp. 7, 135). Chapter 1 serves as an introduction; the next four chapters provide evidence in support of the thesis. 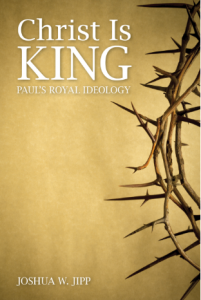 Chapter 2 shows that the ideal king embodied the law in both AKD and Paul’s Christ-discourse. (Jipp uses this insight to explain “the law of Christ” in Gal 6:2 and 1 Cor 9:21.) Chapter 3 argues that just as kings were praised through royal encomia in AKD, Christ was praised through a royal hymn in Col 1:15–20. Chapter 4 suggests that the king had a unique relationship with the gods and the people in both AKD and Paul’s Christ-discourse. (Jipp also suggests here that AKD is the key to understanding Paul’s participatory language.) Chapter 5 establishes that the king was discussed using righteousness/justice language in both AKD and Romans. Chapter 6 is the conclusion. Jipp’s book has two major strengths. First, Jipp’s research is outstanding. His interaction with Greco-Roman sources is particularly impressive. His 48-page bibliography (accessed throughout 1,000+ footnotes) includes sources ranging from ancient poetry to LXX commentaries to specialized studies in biblical theology. Second, Jipp has successfully and convincingly demonstrated that AKD had a significant influence upon Pauline theology. While the strengths of Jipp’s book far outweigh the weaknesses, a few points of critique also need to be made. First, Jipp ties Paul too tightly to Second Temple Judaism rather than to Scripture. For example, Jipp repeatedly describes Paul as an innovator who creatively reworked the cultural scripts of his day (including Scripture) to generate a new perspective on the Christ, all because Jesus surprisingly rose from the dead (e.g. pp. 13–15, 42, 273–275). Jipp seems to be suggesting that none of the prior biblical tradition anticipated a resurrected Christ, contrary to the claims of Jesus (Luke 24:25–26), Paul himself (1 Cor 15:4), and John (John 20:9)—not to mention the OT authors. Paul’s contemporaries may not have anticipated a resurrected Messiah but Scripture did. Given Paul’s familiarity with Scripture and his skill in biblical interpretation, can he really be called an “innovator” for speaking of a resurrected Christ? Another example is seen in Jipp’s uncritical assumption that Paul was always working from the LXX, a culturally-biased translation of the Hebrew Bible. (Yes, Paul did frequently reference the LXX, as a modern-day scholar might reference an English translation, but that does not mean Paul got his theology from the LXX.) Paul was not ignorant of the Hebrew Bible, yet Jipp completely ignores the MT when discussing the relationship between Paul and the OT (e.g. p. 101). Yet another example is Jipp’s suggestion that Paul disagreed with the Psalmists about righteousness and depravity (pp. 240–242). To connect Paul so closely to first-century Jewish thought, rather than to sound OT interpretation, is a great disservice to a thoroughly biblical teacher. A second point of critique is that Jipp sometimes overreaches in his quest to find links between Pauline Christology and AKD. Jipp is able to connect Paul’s words to royal LXX passages using only a single word (pp. 101, 108, 117–118)—a procedure that those versed in biblical intertextuality will find suspect. In addition, Jipp sees kingship in the language of firstborn (p. 107), beginning (pp. 116–117), fullness, pleased (pp. 120–122), peace, access, suffering (p. 173), reconciliation (p. 181), and coming (p. 205). He suggests kingship is even implied by the language of priesthood, temple, gift, wisdom, and body & spirit (pp. 275–276)! The reader is left with the impression that Jipp is wearing kingship-tinted lenses when he reads the Bible. Third, Jipp casts OT kings as intermediaries between God and man (pp. 149, 209), but this may be a mischaracterization of the biblical picture. The OT presented the king as being in solidarity with the people. For example, the only positive law in the OT concerning kingship (Deut 17:18–20) simply stated that the king must devote himself to the Law (like every other Israelite) and not exalt himself above the other members of the community (p. 55). The Psalms likewise portrayed the king as being in solidarity with the people (pp. 163–165, 227). Where, then, is the biblical evidence that OT kings stood in a unique, intermediary position between God and man? Jipp suggests divine sonship was a special, royal trait (pp. 106–107), but all of Israel was referred to as God’s son (Exod 4:22). Jipp says AKD rulers were “spoken of as images of the gods” (p. 103), but so was all of mankind (Gen 1:27; 9:6). Jipp identifies “anointed” as a distinctly royal trait (pp. 33, 152), but the Spirit was not reserved for kings—and Paul himself used the same language to describe his readers (2 Cor 1:21). The evidence provided in Christ is King does not support the notion that OT kings had a special intermediary role. In spite of the few points of critique provided above, Christ is King is an impressive, important, thought-provoking contribution to the field. Jipp tackles some of the biggest issues in Pauline theology (Law, hymns, participation, righteousness) and explains all of them within a single framework. The book will be most helpful to seminary students and biblical scholars who are doing research in the areas of Pauline theology, Christology, or biblical kingship. Individual chapters will appeal to those researching a specific topic addressed by the book: the relationship between Christ (or Christians) and the Law (Ch 2); the Christ-hymns (Ch 3); Union with Christ (Ch 4); Paul’s righteousness and justification language (Ch 5). In addition, Chapter 2 is one of the finest examples of social-scientific interpretation available today and is therefore highly recommended to all upper-level students as an example of what NT scholarship should look like.